Signal Hill, where the first transatlantic wireless signal was received in 1901, is a must see destination in St. John’s for its gorgeous views of The Narrows, South Head, and the Atlantic beyond. This route makes its way out to the challenging hill via Memorial University, hitting some beautiful residential areas along the way. Start on Whiteway Street on the south side of the University. Head west on Whiteway, then use Bonaventure Ave to connect to Pinebud Ave, a quaint residential street. Where Pinebud ends, take a LEFT onto Carpasian Road, then take a RIGHT onto Rennies Mill Road, a nice stretch along the Rennies Mill River (walking path parallels the road). After crossing Route 40, take a LEFT onto Empire Ave, which will drop you down to Signal Hill Road. The route gets tough and hilly here, but the views are incredible. 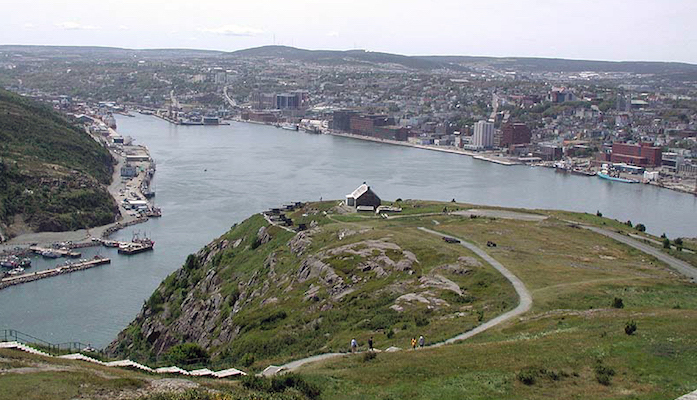 Our route turns around at The Battery, but for an add-on, can run another 1 km out to the Signal Hill Historic Site, or do ~2 km loop of the roads around Signal Hill. Surefooted runners may be inclined to extend their run with some of the trails around North Head, but be advised that the rocky, narrow trails here drop off steeply. For the return, retrace your steps or use Empire Rd. west of Rt. 40 for some variety. NOTE: there is a walking path between Whiteway and Pinebud, and along Rennies Mill Road (Rennies River Trail). It’s a good alternative if you prefer to stay off the streets.